Within the pomp and glory of this week’s Commonwealth Heads of Government Meeting, is an age-old institution looking to re-set its place in the world? Its future could be a bright one if the UK works with India – and the man of the moment, Prime Minister Narenda Modi – to capture the imagination of the next generation around what the Commonwealth can achieve, writes India Inc. Founder & CEO Manoj Ladwa. The Commonwealth needs to reinvent itself if it wants to become a multilateral institution with global currency. This is against the backdrop where multilateral institutions across the world are struggling to stay relevant. President Trump’s disdain for the US’ contributions to NATO taskforces and the suspicion levelled at the EU by parts of the British political left and right show that these organisations are under fire to show how they can achieve more than solely the sum of their combined efforts. It is clear that multilateral organisations cannot continue as they have done. Yet the Commonwealth is a huge force to be reckoned with. Commonwealth nations are globalising at an enormous pace, and during 2003-2013, trade in goods and services between Commonwealth countries expanded from $266bn to $592 billion. That figure is expected to pass $1trn by 2020. On a trade and economic level, the Commonwealth can present a truly competitive alternative to the ASEAN and proposed RCEP. On every other level, it must lay the grounds for peace, collaboration and transformation that have allowed the EU and NATO countries to flourish. With a bold commitment from the UK and India, this is possible. London holds many crowns, but it should not be the only capital city of the Commonwealth. It needs to start sharing this responsibility and if any city should be given this honour, it should be New Delhi. Over half of the Commonwealth’s 2.3bn citizens are Indians. A revived Commonwealth should reflect Indian interests and India’s template for global transformation. India wants to engage with a rejuvenated Commonwealth, an emblem for the future that presents a major opportunity for its citizens – 60 per cent of whom are under 30 years old. Fortunately, political leaders in India and post-Brexit UK are in close agreement that the Commonwealth could possess an advantage for both nations as they redefine their position on the world stage in the coming years and decades. India seeks a proactive partner in the UK – one that can help it become a Permanent Member of the UN Security Council, for example. Together with India, the UK can reimagine and reinvigorate the Commonwealth. In doing so, they will show that they are committed not only to strengthening their transactional partnership, but creating a transformational partnership, too. 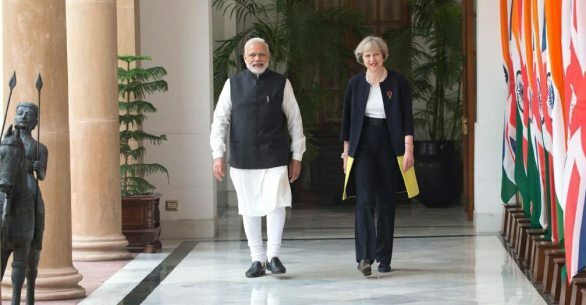 Brexit Britain and Global India both sense an opportunity to knock down barriers to free trade – widely heralded as the secret to Western Europe’s greatest period of peace and prosperity since the Second World War. Yet Commonwealth trade can only continue to grow if Commonwealth countries are ready to place new ideas at the heart of trade and investment: technological transformation in health, science, industry; high-yield impact investment and sustainable development driven by financial and technological innovations; and a recognition of the threats and challenges faced by the Commonwealth’s youth. Where India places great value on economic ties overseas, the Commonwealth presents a great opportunity. India has an ambitious target to increase trade with the African continent to $90bn and will not achieve this without agreements with the Commonwealth’s 19 African nations. The Modi Government also has a key target to attract greater inward investment, boost its export order books and to establish a healthy balance of payments by attracting more manufacturers to India. The Make in India campaign has targeted an increase in manufacturing’s share of India’s GDP from 16 to 25 per cent by 2022 and lionises new technologies and digitally-integrated production lines that can cut costs and lead times for new parts. However, there is a greater ambition behind this move. India wants to become a leading manufacturer of new green technologies, from photovoltaic technologies to electric vehicles, which are fast becoming central to the way we live in cities and rural areas. This is where PM Modi has shown international leadership and a yearning for action on a multilateral level. PM Modi launched the International Solar Alliance, his initiative to harness potential for solar energy in equatorial countries, which has enormous support from France and former French colonies in equatorial regions to create a belt of solar energy-rich nations. The UK’s commitment to join, this week, is an acknowledgement of PM Modi’s leadership in global renewable technology. India is not solely interested in trade transactions – it wants to play a transformative role placing green energy, digital technology, young leaders and balanced growth at the heart of development. The Modi Government, which holds Indians overseas in great esteem, is fully aware of the overwhelmingly young demographic in the nation. Over half of Indian citizens are under 25 years old, battling with technological factors changing the nature of skilled work and even driving down the number of jobs in high-productivity industries, in some parts of the world. Many of India’s youth have little access to higher education or vocational education to secure opportunities in emerging industries and help to build the prosperous India that PM Modi wishes to create. Against this backdrop, Indian students are becoming more mobile and many Indian students wish to study at the UK’s world-leading universities, as well as institutions with which UK universities compete. Emmanuel Macron wants to double the number of Indian students studying in France, helping to unleash opportunities and skills for the next generation of Indians. If the UK can match this commitment, more of the next generation of Indians will have the opportunity to become world leaders in their chosen field, not to mention lifelong ambassadors for the UK. The Commonwealth is rich in heritage, but it desperately needs a new legacy – working with the India to lead the Commonwealth into a new phase where it champions peace, education and prosperity in some of the most aspirational countries in the world, could surely be the formula to sustain this wonderful institution for the future. *The above article was first published in International Business Times.